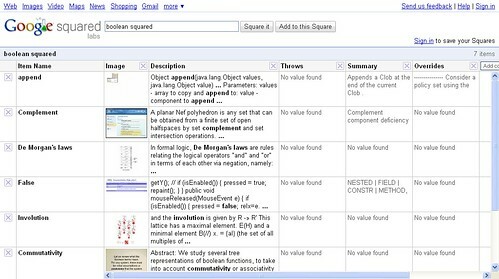 So, Google has a new search tool called Google Squared, which presents search information in a grid formation of related concepts. 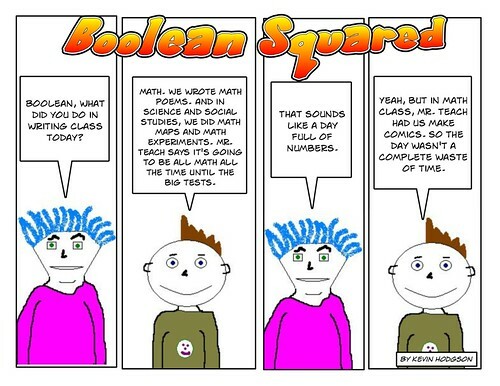 Given its name, I thought it would be fair to square off (excuse the word pun) the search engine with my webcomic, Boolean Squared. Alas, my comic didn’t even show. Too many math references to Boolean Logic, I guess. This week, we turn back to Voicethread to share out our sentences. You can do it with video, audio or just type in your Day in a Sentence. We hope you join us over at our voicethread. You can get there by following this link or by using the embedded Voicethread down below. Spread the word. Let’s see if we can fill up the square with voices. This comes from the TED site. Wow. This poem was highly amusing. I was adding some of our digital science picture books to the Longfellow 10 site this morning when I realized what an accomplishment that site has achieved over the course of the year. The Longfellow 10 is (as George writes at the site) a: “… loose confederation of unknown students in undisclosed locations in cyberspace looking to promote awareness of important literary terms (and Science Concepts!) through absurd stop-motion films.” And more. My students are now launching into a final project in literature class. We divided the class into two and one group read The Watsons Go to Birmingham and the other read Roll of Thunder, Hear My Cry. Both books are powerful examples of racial tension and the need for tolerance. SO, with just a few short weeks left, we are doing a claymation project around the theme of tolerance. Our aim is to publish the movies at Longfellow 10 before school gets out. I’m not sure we can make it, but we’re going to give it a try. They were storyboarding yesterday and will begin making clay characters today and maybe start filming tomorrow. We’re on a tight schedule! I’ll reflect more as we go. This is the final sharing of student digital science books. These guys worked hard to use a comic book style for their production, layering in sound effects, narration and speech bubbles. It didn’t quite convert into video the best, but it is still effective. (Note: Charlie and Steve are the custodians at our school and favorites with the kids). This book is called Mitosis with Charlie and Steve.